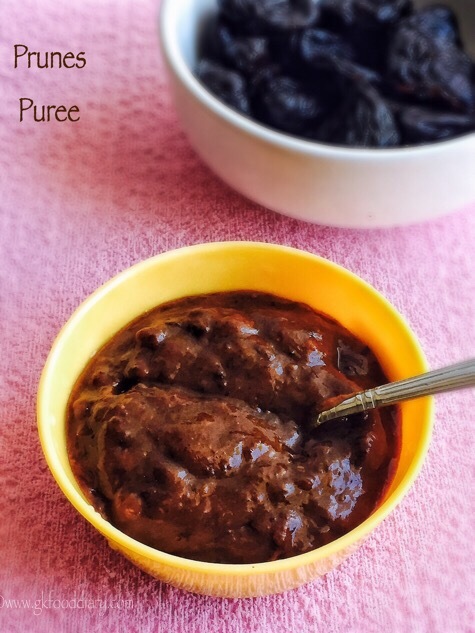 Prunes are less allergic in nature and hence it can be included from babies diet from 6 months. When you introduce, you can offer as plain prunes puree and then gradually shift to mashed prunes and give as a finger food by cutting into tiny pieces around 8 months. If your baby doesn’t like the taste of plain prunes puree, you could add them to cereals/ porridges. Always choose natural prunes which are sulfate free and without chemicals. 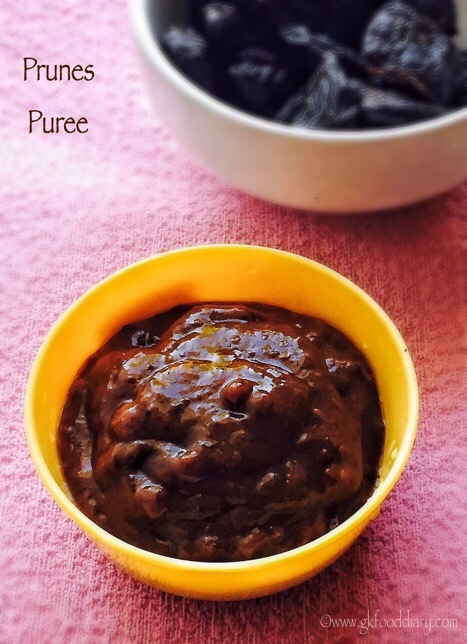 Here is how to make prunes puree for babies. 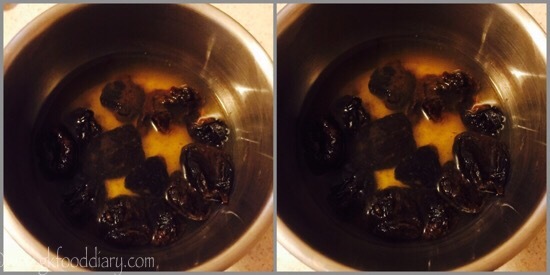 Soak the dried prunes in warm water for 30 minutes or until they are soft enough to mash. You could alternatively steam the dried prunes for 10 minutes. 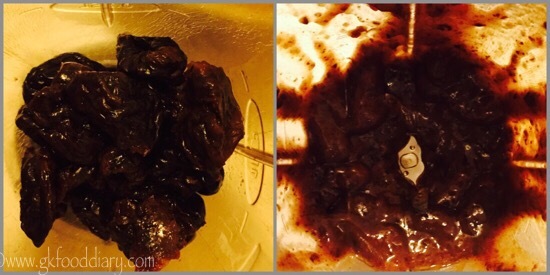 Once the prunes are soft, puree them in a blender with the water used for soaking. You could also mash them with your hands for older babies. If you would like to juice them, blend with more water and strain the juice using a strainer. 1. 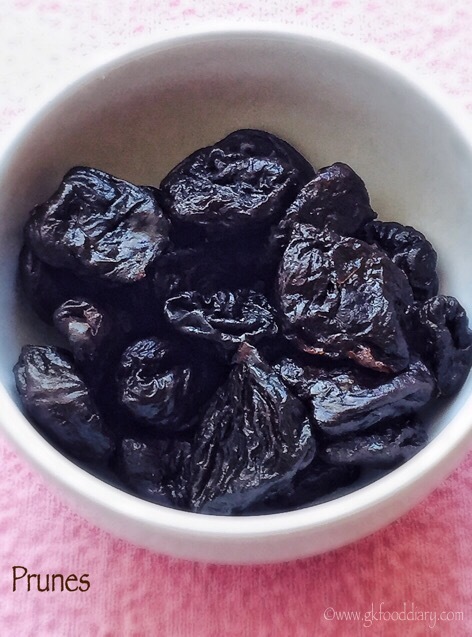 Soak the dried prunes in warm water for 30 minutes or until they are soft enough to mash. You could alternatively steam the dried prunes for 10 minutes. 2. Once the prunes are soft, puree them in a blender with the water used for soaking. 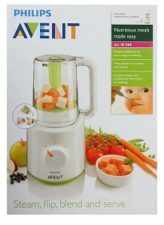 You could also mash them with your hands for older babies. If you would like to juice them, blend with more water and strain the juice using a strainer. The dried prunes puree is ready to feed your baby. This recipe makes two servings. Begin with a small amount and always serve prunes in moderation. You could mix prunes with apples, bananas, blueberries or yogurt to make it tastier. But if using as a remedy for constipation, plain prunes puree is the best. If you are giving prunes juice for relieving constipation in babies, give in moderation as no liquids shouldn’t replace breastfeed or formula feed until one year. Start with a small amount when you introduce. it keeps well for a day if refrigerated..